Schenck Process has recently added new features to its Disocont loss in weight feeder control platform that customize, simplify, and enhance the user experience. Some of the key additions include a favorite’s folder, customizable calibration sequences, detailed event message text, and the use of HTML5 for online equipment monitoring. Utilizing the Schenck Process Easy Serve Service Tool, a favorite’s folder can be created giving operators quick access to all the different parameters that are critical and unique to their individual process. Parameters that are rarely used can be hidden eliminating the need to search through multiple parameters that are not relevant for the user’s particular process. 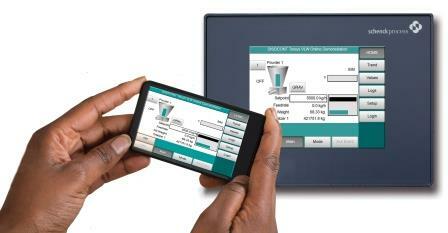 A customizable calibration sequence easily leads operators through the required calibrations. Sequence checkmarks indicating that a calibration has been completed, progress bars, and detailed status and event messages are just a few of the enhanced operational features available with the Disocont Tersus controller. A change from Java to HTML5 for web page HMI provides a much wider range of access and compatibility through various web browsers and smart phones including Apple products.